Through time, many artists of all stripes have self-published their own works to assure their place, however large or small, in posterity. What a pity if Charles Ives hadn’t gone to the trouble of getting much of his music into circulation. For performers to play precisely what interests them (and not necessarily their managers or record producers), it’s a little more difficult due to the expense of hiring a concert hall or laying down tracks without someone else’s deep pockets. With the arrival of LP Classics, (however the logistics were managed), the world can look forward to interesting, “unsafe” (compared with the bestsellers) repertoire done up with passion, conviction and considerable skill. Well known to these pages (cross-reference below), pianist Vassily Primakov has teamed up with fellow Russian Natalia Lavrova and filled their inaugural CD (and the company’s board room) with a duo piano collection that will grace any collector’s shelves. 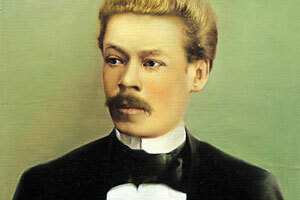 Four Suites by Anton Arensky comprise the disc with Lavrova (No. 1, No. 3) and Primakov (No. 2, No. 4) taking their turns as “Piano 1.” The result is a compelling testament to a musician whose popularity (as composer, conductor and performer) was likely never greater than during his lifetime. Truth be told, my own experience with this St. Petersburg native was conducting his Variations on a Theme by Tchaikovsky with the Nepean Symphony Orchestra. More obvious—necessarily—in that work for strings, the prolific creator owed much of his output to studiously learning from all who had come before. Just the same here, the homogeneity of all strings is matched by the twin hues of two concert grands. The three movements of Op. 15 are infused with graceful lyricism and a glancing reminder of Paganini bravura rendered with equal measures of power and poise. The “Waltz” stands out with its whimsical shadings coupled with the flight of a wee bumble bee, refreshing joie de vivre and bold harmonic shifts that cry out to be choreographed to achieve the fullest effect. The concluding “Polonaise” is a vrai Invitation to the Dance tempered with a calming middle section. The ensemble fits like a glove even as Lavrova displays elegant control in the rhapsodic lines while Primakov keeps everything moving steadily forward. Only a touch of collective over-exuberance mars the sound—perhaps the microphones were too close for comfort. The five “silhouettes” which comprise Op. 23 begin with homage to Wagner (“Le Savant” where Primakov is delightfully light in the top register) and a heady mixture of French and German styles (“La Coquette,” full of charm at every trill and turn—who wouldn’t be seduced?—and a magical minor ninth. “Polichinelle” features most welcome tonal/rhythmic changes with both players secure in their “busyness” as they deliver perfect balance on all fronts. “Delicoso” seems an apt descriptor for Arensky’s beautifully crafted dreamer (“Le Reveur”). All that the closing “La Danseuse” requires are castanets and a blood-red rose to complete the Spanish flavour. What fun the protagonists have and share! Darkness, sombreness, bitter sweetness: all find their way into the theme that artfully binds the nine following variations for Op. 33. Back as Piano 1, Lavrova contributes much to the nicely understated “Dialogue” and the at times jazzy fun of the “Waltz.” Primakov shows his mastery of “reading between the bass lines,” keeping the music perpetually flowing by adding weight, length and emphasis to the lower reaches. The highlight of the set is the “Scherzo,” bursting at the seams with chattering lines and ever-engaging cross rhythms. The frenzy of Ibert’s Divertissement and Bizet’s Jeux d’enfants seems to knock at the door of this near-Perpetuum Mobile but Arensky finds his own way and—finally—seems reluctant to let it all end. Immediately following, Beethoven is never far away from the broadly expansive Marche funèbre which is particularly well-voiced as an aura of major hope slips the ear (and soul) seamlessly into the compellingly gentle “Nocturne”—surely one of the composer’s finest ever. The twin pianos melt together as one. Without doubt, Chopin drives the final “Polonaise” with powerful abandon even as the performers push mixing board pegs to the limit.